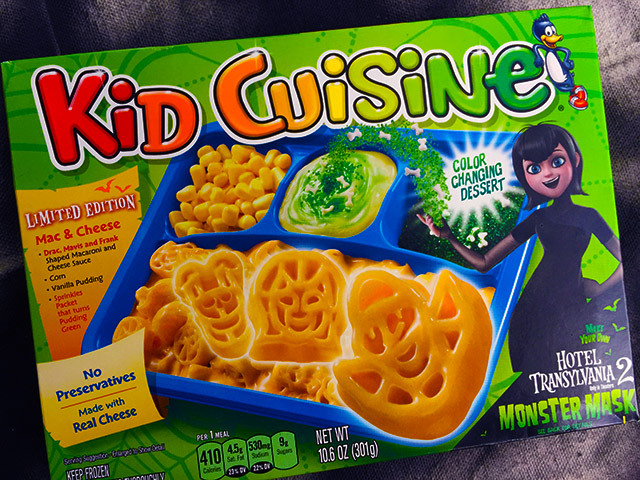 Halloween Kid Cuisine: 2015 Edition! | Dinosaur Dracula! 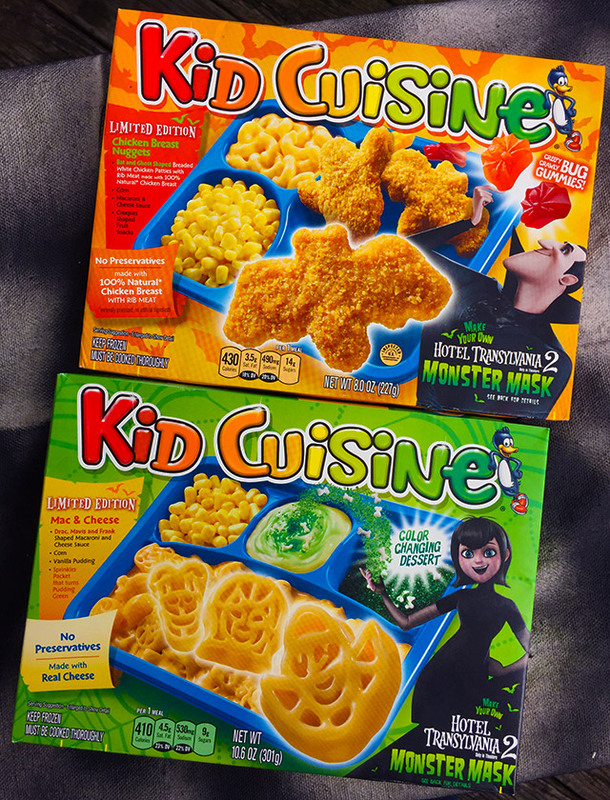 Halloween Kid Cuisine: 2015 Edition! 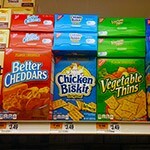 Warning: Today’s post is about Kid Cuisine, so stop here if you don’t want to read about Kid Cuisine. Funsucker. 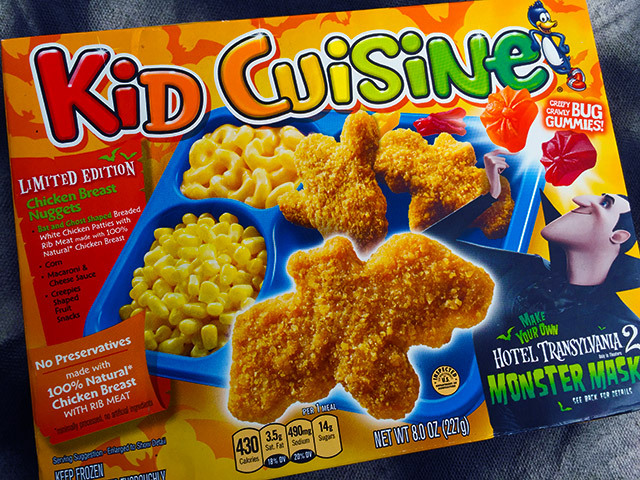 I was elated to see the return of Halloween Kid Cuisine meals, even if they never actually use the “H” word. 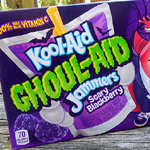 The secularization of Halloween? No, not really. This year, they’re positioning them as strict promotions for Hotel Transylvania 2, which hits theaters sometime between tomorrow and whenever my bat-shaped chicken nuggets expire. 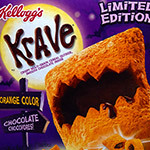 Still, I don’t think it’s a stretch to call these Halloween editions, especially since they borrow traits from previous KC Halloween meals. 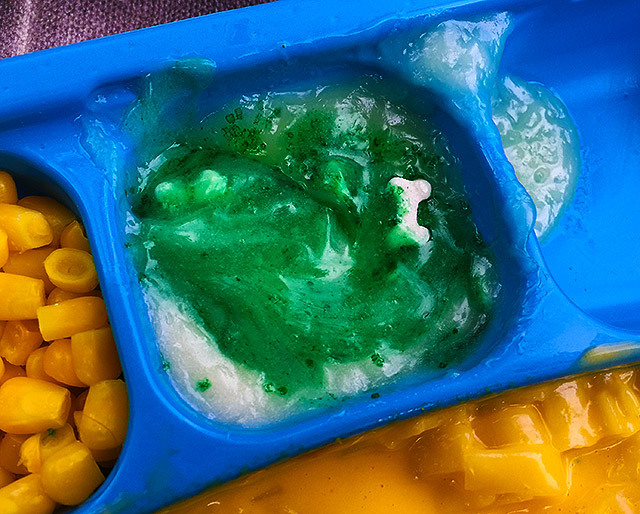 From what I can tell, every variety of Kid Cuisine is currently redressed for Hotel Transylvania 2, but these were the only two that went all-in on the creep. 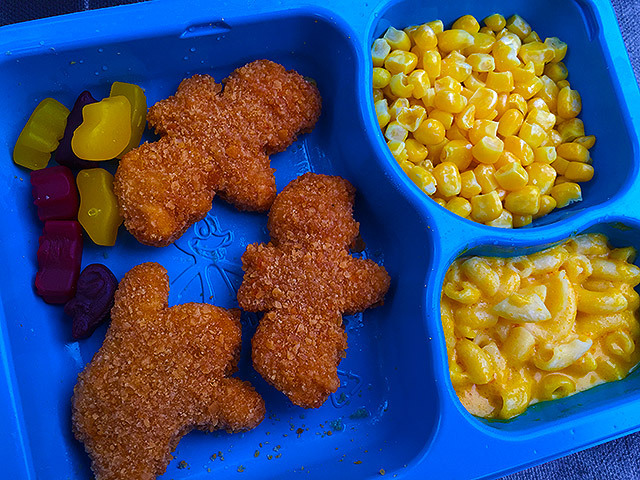 The chicken nuggets meal is breathtaking if you haven’t seen it… but less so if you’ve been following Kid Cuisine’s exploits for years. They always do bat-shaped nuggets. The only difference between this and last year’s versions is changing the “alternate” nugget shape from a pumpkin to a ghost. I’d call it an improvement, personally. Those nuggets are like the spirits of chickens, which, considering their present condition, makes absolute goddamn sense. 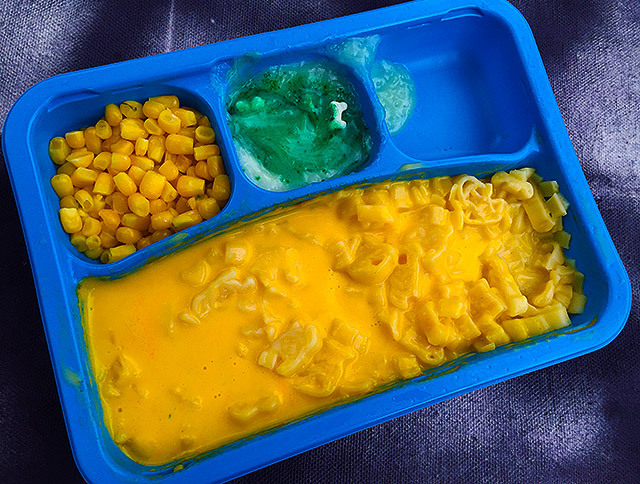 The side dishes are unchanged: You still get a handful of corn, and a handful of mac & cheese, and a handful of completely frozen bug-shaped gummy snacks. I write this so plainly, as if it’s a plain thing to write. I’m not sure I would’ve bothered writing another tribute to Halloween Kid Cuisine were it not for this second meal, which is less on-the-nose but so much more exciting. This time, you get a big, slimy, heaping dose of mac & cheese, with shapes evoking the severed heads of several Hotel Transylvania 2 characters. 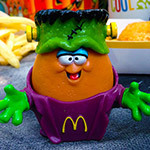 Intended to represent Drac, Mavis and Frank, the pasta faces more closely resemble McDonald’s Changeables. The whole thing is soupy and weird and perfect for Halloween. And then comes the crème de la crème: Color-changing vanilla pudding, complete with a packet of sugar dust and bone sprinkles. It looks like something a He-Man villain might fall into at the end of a big battle, but I give them 75000 points for trying. PS: You can totally pay homage to The Raft from Creepshow 2 with this stuff. Even the bones make sense. I’m gonna float some Guatemalan worry dolls on a piece of Chex in there. You’ve heard of Picasso? I’ll be Picasshole. Each box comes with a cutout monster mask, further proving these to be all-out Halloween editions. The masks would scarcely fit over even the smallest child’s face, so it is fortuitous that I live with a ten pound skinned torso. 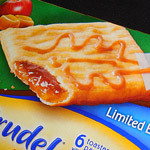 I know that these meals won’t seem palatable to most, so I’ll remind you that they’re made for a target demo that likes sucking up warm yogurt from subjugated Fla-Vor-Ice tubes. It would be unfair and ridiculous to judge them using normal criteria. I’m still glad that they’re here, though. 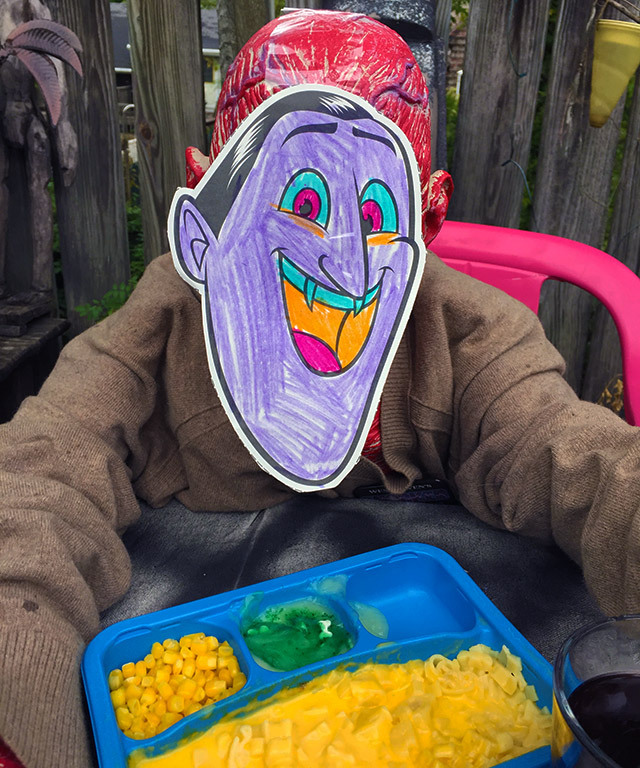 I so love the idea of kids having Halloween versions of TV dinners. Picture it: You’re six years old, it’s a stormy night, and Mom and Dad are ambivalent about dinner. 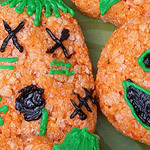 You wouldn’t just be eating a meal — you’d be making a Halloween memory.